Manchester City and Uefa are yet to agree the club's punishment for breaching financial fair play rules. The two parties are understood to be some distance apart over a potential deal on financial and sporting sanctions. 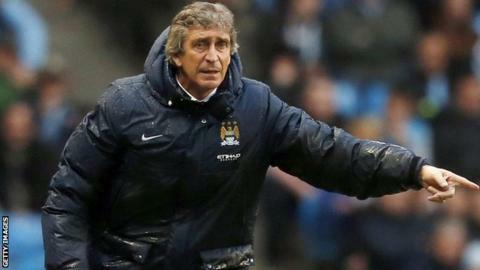 League leaders City have until Friday to reach a settlement with European football's governing body. The other eight sides to fail FFP are believed to have settled, or are on the verge of settling, a deal with Uefa. However, City officials are thought to have balked at the penalties offered to them for contravening Uefa's 'break-even' test by the governing body's independent investigatory panel. The sanctions include a penalty in the region of £50m, together with restrictions on the size - and wage level - of the club's squad for next season's Champions League. Speaking in March, Uefa's general secretary Gianni Infantino said FFP rules had been introduced to stop "greed, reckless spending and financial insanity". The overall aim of FFP, which has also been failed by French champions Paris St-Germain, is for clubs to financially break even. However, in this first accounting period, which covers the 2011-12 and 2012-13 seasons, an aggregate loss by clubs of up to £37m is permitted by Uefa, provided the club's owner can cover the deficit. Cas is prepared to make a quick ruling for clubs in dispute with Uefa to provide clarity before the start of Champions League fixtures in July.